Taste: Creamy, soft, fine, almond-like, round and fruity. Great with: Grilled vegetables, mashed potato, pasta vongole or pasta pesto. Taste: Fresh, grassy and green. Great with: Salads, mozzarella, seafood, green beans. Taste: Robustly green, a hint of bitter, peppery and green tomato. Great with: Salads, roast seafood, steamed vegetables, mash. Taste: Green, fruity and a hint of pepper. Great with: Burrata, mozzarella, antipasti, salads, bread. 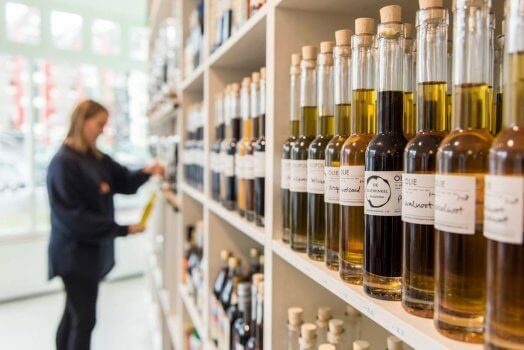 Olive: 80% Maraiolo, 15% Frantoio, 5% Leccino. Taste: Robust, complex, green bitter, spicy with a hint of artichoke. Great with: Bread, a sturdy ribollita-soup, grilled red meat, carpaccio. Olive: 40% Frantoio, 10% Moraiolo, 40% Leccino, 10% Olivastra. Taste: Light, elegantly fruity, round with a hint of apple. Great with: Spanish seafood dishes, lentil salad, bread, salad, hummus. Taste: Black olive, honey, sweet and rich. Great with: Gazpacho, pan con tomate, lentil dishes, bean dishes and vanilla ice-cream. Taste: Fresh, slightly nutty and a little sweet. Great with: Salads, fish dishes, bread, roast chicken. Olive: totally organic 33% Ladolia, 33% Adramitiani, 33% Kolovi. Taste: Creamy, green and fresh. Great with: Greek salad, fish dishes, tzatziki, roast meat and roast fish. Olive: 100% Koroneiki, Terra Creta. Taste: Black olive, ripe fruit and earthy. Great with: Salade Niçoise, aïoli. 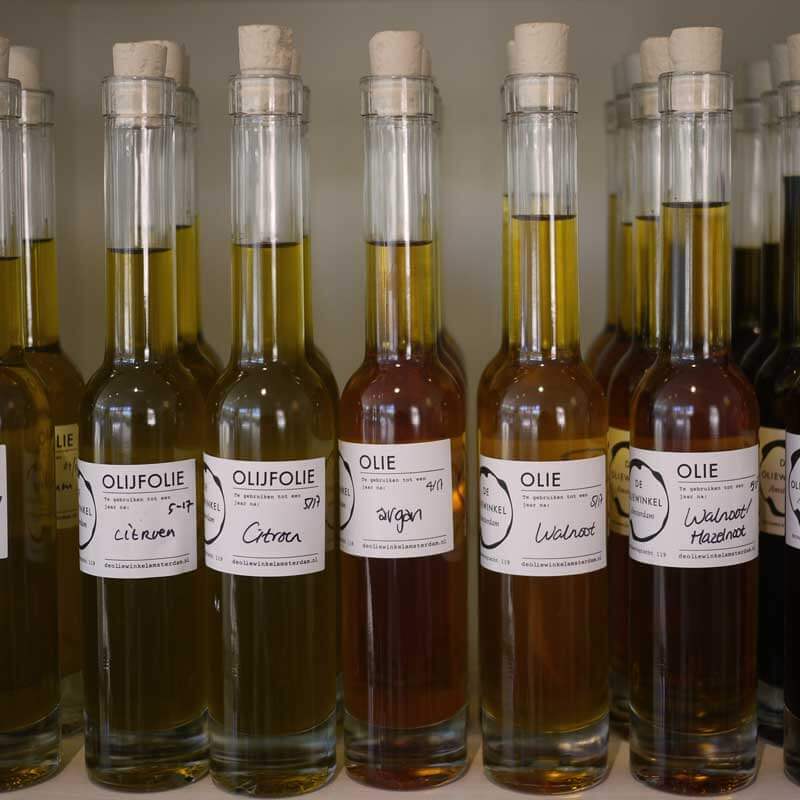 Olive: Salonenque, Aglandau, Verdale en Grossane. Through infusion, this oil (from the Tarragona-olive) acquires and aromatic basil taste. While pressing the olives, lemons are also pressed with the olives. The oil is from Gaeta in Italy. The artisan nut oils of the Castagne family in Martel in the French Dordogne are made in a traditional manner, and are pressed in a centuries old mill. This rare oil from the argan fruit is also called Moroccan gold. The taste is a nutty and complex taste. Argan oil is pressed in a traditional manner. It is said that the best pumpkinseed oil hails from Austria. This also rings true for this beautiful black-green organic oil. It is delicious with bread, salads and soups. We have two different sesame oils in our assortment: a strong Chinese and a milder French variety. The white truffle oil from the Gubbio brand is soft and subtle. You only need to use it sparingly to add a delicious hint of truffle to your dishes. We also sell black truffle oil from Urbani, which has a mild mushroom taste. Essential when making your own mayonnaise, but also perfect to fry food in. This oil can be heated to high temperatures and is therefore ideal for a fondue for example. A very different use: grapeseed oil is perfect for oiling a wooden cutting board to increase its longevity. Peanut oil is the ideal oil to use in a wok. A spicy red chili pepper oil with which to spice up a pizza for example or a pasta dish. Great to fry potatoes in. A lovely oil with shrimps and gamba’s or a pasta Arrabiata.